Many people are a bit wary of switching to HTTPS, especially with the potential loss of rankings while Google recrawls and matches up HTTP URLs with the new HTTPS ones. While Google has said this shouldn’t take more than a couple of weeks, many site owners are still a bit concerned over the potential for things to go sideways. John Mueller posted some HTTPS Q&As and one of the focal points was about switching a site over to HTTPS in phases, or even page by page, and what kind of an impact that could have. # Is it OK to have just some pages on HTTPS? Yes, no problem! Start with a part, test it, add more. # Should I move everything together, or is it fine to do sections? Moving in sections is fine. He further clarified it on Twitter about whether moving half of one site to HTTPS while leaving the rest as HTTP, saying it wouldn’t cause issues, although it is obvious he would prefer all sites go secure. Google is continuing to push for more sites to go secure, and recently announced they would prioritize HTTPS over HTTP URLs in some scenarios. So it isn’t surprising that people are wondering if there could be unintended side effects by not moving entire sites at once. So if you are at all concerned about the potential ranking loss, or to discover any potential issues before switching an entire site over to HTTPS, it is fine from an SEO/ranking/Google perspective to move the site to HTTPS on a page by page or section by section basis…. 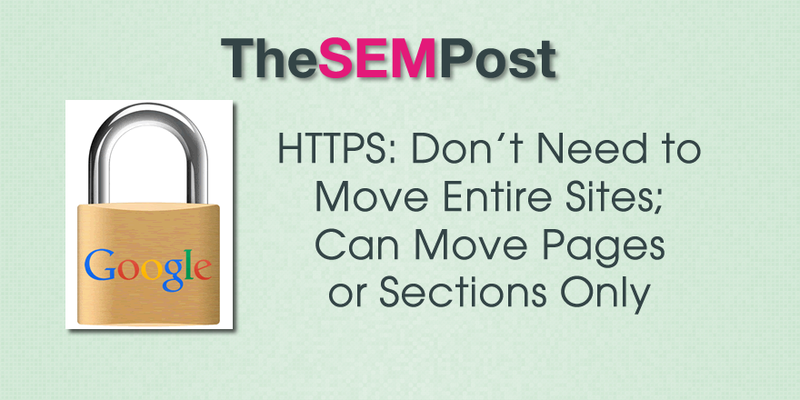 or permanently move part of a site while keeping the remaining part of the site unsecure. But do keep in mind that only pages that are HTTPS will get the secure ranking boost, it isn’t site wide. If only partial pages move to https:// how would I update that in my Google analytic account under property settings?